"I don't think there were many Geography projects that I completed at school that didn't include tales of The Ju-Ju, Ninki-Nanka. the crocodile or the native's black magic and life in Bathurst (now Banjul) in general during that time." In 1942. George duly arrived in Bathurst. Formerly a Navigator, he went into Ops. He kept a splendid album of his time there, which is included in the Photos section of this website. He also kept a hand-written book, detailing every aspect of the RAF which I will add to this site when time permits. Where every day is followed by another - slightly worse. And turns my thoughts to Cornwall, that blessed, happy, land. Where the sky is never cloudy and the grass is never green. Where there isn't any whiskey and the beer is never cheap. sparkles like a diamond necklace in a balmy tropic night. No wonder it’s a “balmy” night – there’s not a girl in sight! Where a Christmas card in April is considered up to date. But we never miss the money for we’d never get it spent. And a hundred fresh mosquitoes come for every one you slay. For this God forsaken outpost is a substitute for hell! The heat was unbearable ... and the mosquitoes! There was hardly a man there who didn't succumb to Malaria, which reoccurred over many years after that. The quinine seemed to do little to help! 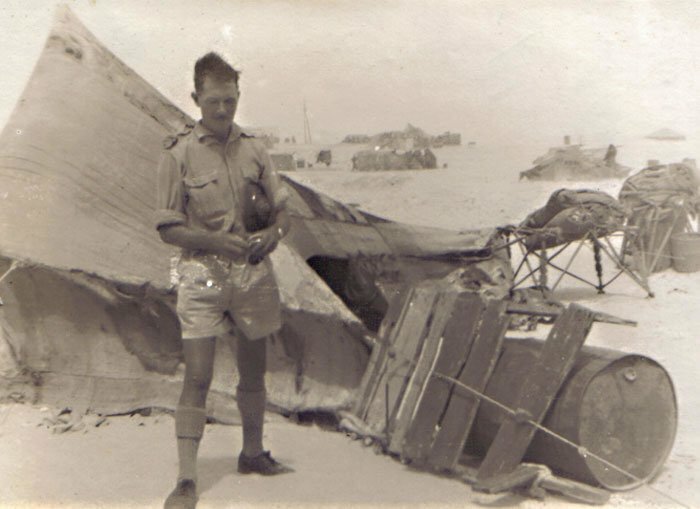 I was to share a hut with three others, Nobby Clarke, (whom I had met in my short time in Biggin Hill before my posting) and I became firm friends. Mosquito nets were essential, as were the tins filled with paraffin in which each leg of our beds were stood to keep the insects from climbing up. Paradise! 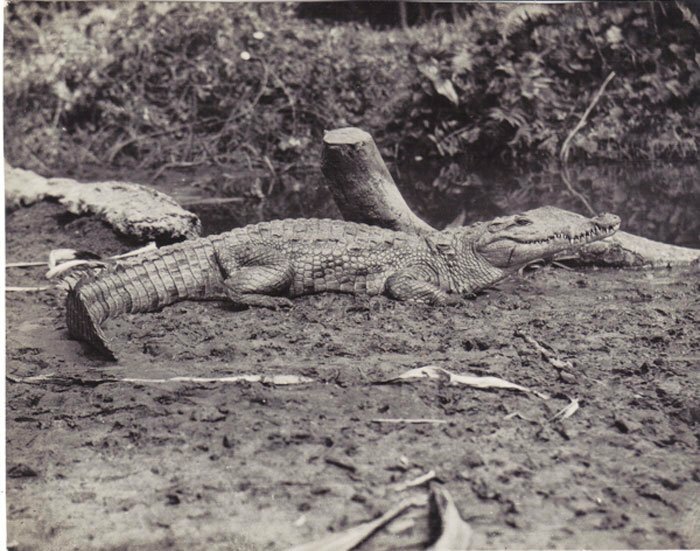 My first introduction was to the crocodile, the notorious "Ninki-Nanka" to be precise, who guarded the nearby pool. My pal took me down there, however, in shocked horror, announced that the croc must have died as he was lying lifeless by the water's edge. I walked over over and gingerly kicked his tail - not a flicker. The second harder kick though caught me quite by surprise as the huge crocodile whipped round, mouth agape, to the raucous laughter of others who had sneaked down to watch another newcomer "fall for it". A tradition I was happy to carry on! Most of us had a pet of some type. One had a small monkey which rode around on his shoulder and would constantly groom his hair. Another, kept a large lizard which changed colour to blend in with it's surroundings when threatened. This was of course tested to the full, although it did pass out once one night, when it was put to the test on a chess board! Mine was a tiny Dik-Dik (a miniature antelope) rescued from a bush fire. Local transport was of course camel and I was allotted Gus, a most disgruntled beast who managed to tolerate me on his back, though he would catch many passers-by with his accurate spit! Bananas! Oh there were plenty of bananas there, truth to tell, I never ate another after leaving Gambia! My rest time pleasure was fishing, a favourite passion of mine. Of fish there was no shortage! A few of us would go up river on native boats... fish a plenty there. Occasionally we would go out into the bush to boost the staple diet and on one occasion came across a huge bird the size of a turkey. It took off, but I was most dismayed that after three shots at it, the damned thing kept on flying! The fourth shot brought it down and when the natives brought it back, I was pleased to say that all four shots had met their mark and we were looking forward to our "turkey" dinner, such a change from the staple Bush cow, but that bird was the toughest chewiest thing we had ever tried eating and it went to the village dogs in the end. I was allotted a native "Personal Boy" during my time spent there, " Fafa Sadi Kalli", who would accompany me and see to laundry etc. Each task given was done with great pride, as they all did. I recall in the cooking area of the camp, one of the natives who was given charge of the highly prized meat slicer, caught another using it and did none other than pick up the nearest cleaver and took the man's hand off. On another, a village girl was caught being unfaithful... she was locked up with neither food nor water, whilst he was punished til death. I do not know what happened to the girl, we did not interfere. This was not our land, nor our culture. My own boy, Fafa Sadi Kali, was very much in awe of my RAF boots, as many of the natives of the village, they were barefoot. In due course, I managed to acquire a pair of boots and presented them to him. His face split with such a grin and his pleasure and continuous thanking and fuss was almost embarrassing, in what seemed to me such a simple gift. To the day I left, he wore those boots strung around his neck and never took them off, not even to sleep! Although in a reserved occupation as an Underwriter at Lloyds of London, George, like many others, joined up to fight for their country and our freedom.